Our footwear collections include the whole family and offer a comprehensive range of shoes for all 4 seasons. Whether you are looking for boots, wedges , heels, sandals or wedges we should have something for your taste and in your size.We might even have a matching handbag for the ladies too. The men's shoes collection features formal to casual and everything in between fromfavourite brands such as Skechers,Kickers and the renowned comfort of HushPuppies. We have an extensive children"s footwear collection too featuring everything from wellies to school shoes and all at exceptional value for money. Combining style, quality and value is the Barratts ethos . 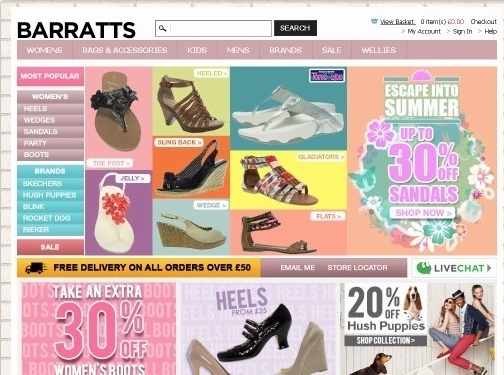 UK (HQ'd in Bradford) based company offering men's, women's and children's shoes for sale. Website features e-commerce facilities, delivery and returns information, terms and conditions, blog, FAQ (under "Contact"), full company contact details.